Social data stuck in a silo? As the social landscape fragments, the variety of ways that consumers engage with your brand continues to grow. Knowing what to measure, and making sense of every interaction that is happening across your platforms and properties, has become an incredible, time-consuming challenge. 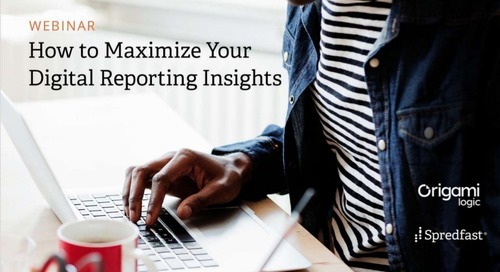 While social media management and execution tools provide basic reporting, modern marketing campaigns require a comprehensive and holistic approach to measurement and analysis in order to realize their full potential. Global brands such as Visa, Intel, Pernod Ricard, and JCPenney are tackling the complexity of social by standardizing and scaling best practice measurement across paid, owned, and earned media. Tracking marketing performance across all channels and platforms in real time, they are able to assess and optimize their marketing strategies, faster. 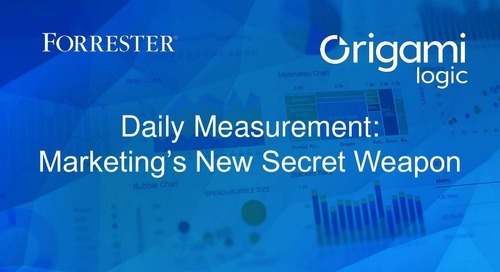 Use these practical tips to learn how your organization can improve its measurement effectiveness and marketing insights. Our latest release, Origami Stories, scans your marketing data and surfaces interesting observations personalized to each user, on your mobile device. Learn about the latest mobile ad opportunities and how to activate them alongside a strong measurement foundation. View this presentation to gain insight into how top brands measure and optimize mobile campaigns. Learn the three key steps to delivering transformative, targeted brand experiences for digital video campaigns. Make more informed campaign decisions with a data model that’s designed for modern marketing. Everything you need to know about measurement, creatives, and inventory quality. Tips and tricks for a marketing dashboard that will help you improve AND prove the value of your marketing. In this slideshow we define key terms like “data”, “measure”, “metric,” and “KPI”, and explain why best-in-class marketers are better at knowing what metrics matter. This presentation highlights which tactics and approaches were leveraged in the most successful sponsor and non-sponsor brand marketing campaigns.